When I was a little girl, I wanted to be a thesaurus when I grew up. That dream never came to pass, but today I did get to be an idiom for a little while instead. The day began like many others. The morning sun peeked through the lingering night-time rain clouds, the birds began choir practice in my trees, a gentle breeze lifted my curtains and brought the scent of mangoes across my typing desk, the cat puked up a wad of half-chewed bamboo leaves on my front stoop… Yes, a day like many others. I didn’t rush to clean up the cat’s mess. I was still in my PJs, and enjoying my coffee. The cat had wandered off to new adventures; besides, the mess was outside and organic. It could wait. Eventually, I went out to grab the hose, figuring I might as well wash the whole porch while I was at it. However, instead of a dusty porch and a sad little pile of mushy green bamboo-barf, I saw an over-excited swarm of giant red ants. Apparently, in some ant dialects, “cat vomit” and “buffet” are synonyms. The cat had produced a puddle about 2 inches in diameter, which in less than 20 minutes had become the epicenter of a swarm of ants almost 2 feet across. These aren’t your everyday “Let’s ruin your picnic” ants. These are the ants that audition for roles in Indiana Jones or National Geographic movies. 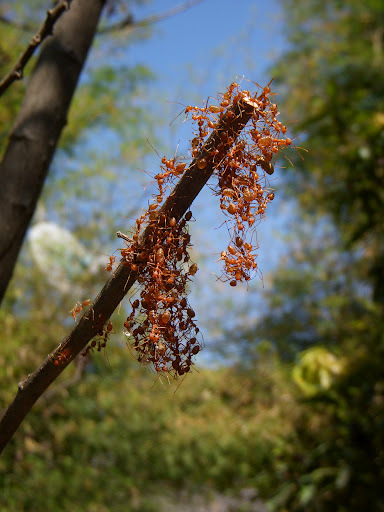 These are the very ants that got angry with me last winter for trimming their branch bridge – and then tried to re-build it themselves with nothing but sheer determination and acrobatic acumen! I’m happy to say, I’ve never seen these ants inside my house, but I still wasn’t thrilled about having them turn my porch into an insect party-palace. So, I turned the hose on, and washed them all back onto the lawn. I don’t think any of them were even injured. Sometime in September, aging ants will be telling their grandchildren about how they survived the Great Hosedown of May 30th. As anyone in a flood would do, some of the ants headed for higher ground. Some of them headed up the hose and onto my arm. Some of them headed up the broom and onto my arm. Some of them took advantage of my distracted arm-slapping and headed up my legs. The leg-climbers were sneaky though. They kept a low profile until the deck was washed, and I was back at my computer. You know how after one bug crawls on you, you imagine all sorts of bugs crawling on you? But then you tell yourself, “Don’t be silly. It’s just a loose thread, hair, crumb or popcorn kernel”? That’s what I was telling myself as I felt little tickles and itches on my legs – until eventually I realized that loose threads, hairs, crumbs and popcorn kernels don’t continue to crawl after you’ve scratched them. I won’t tell you what happened next, because who knows what ads Google will come up with next to this post if I describe the hasty removal of my attire, or the frenetic dance that accompanied it. In the end, there were really only a couple of ants in my pants…but they were enough to have me twitchily slapping myself for the rest of the day when any loose thread, hair or popcorn kernel accosted me. All in all, given the choice between pursuing my dream of being a thesaurus, or settling for living the idiomatic dream, I’m gonna keep reaching for those stars/celestial orbs/celebrities/luminaries/headliners. This entry was posted in Cottage Life, Everyday Life Abroad, Thailand and tagged bugs, Thailand by Janice Hillmer. Bookmark the permalink. Haha, You're right Sally. I missed that – me and my need for precision!